For a movie with a tired plot and a silly gimmick, My Young Auntie offers a surprising amount of substance. A dying man wants to leave his estate to his good nephew instead of his scheming brother. He marries a woman, entrusting her to deliver his will. 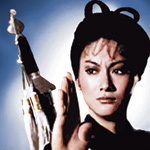 As pointed out in the audio commentary by Andy Klein and Elvis Mitchell, director Lau Kar Lung come not from a writing or filmmaking background, but rather from action choreography. Compared to other Shaw Brothers movies, My Young Auntie is much less of a solid story well told, and more of an excuse to string together several interesting fight scenes. Within the thin shell of a story there beats the heart of a cinema-lover. One can see influences as diverse as screwball comedies, swashbucklers, Technicolor musicals, and of course, other kung fu movies. The plot shell allows an elaborate street scene that comes right out of some 1950s Hollywood studio film, complete with bubble-gum color scheme. It allows for a masked ball, with Errol Flynn-inspired costumes and swordplay. And of course it allows for a big kung fu battle, the film’s finale, at the nephew’s house. Unlike other films in the Dragon Dynasty series of Shaw Brothers movies, nobody killed by the kung fu in My Young Auntie. The fights are cartoon situations where people just get conveniently knocked out of the scene. Even the villain who gets stabbed with swords and knives comes out unscathed because of his “hard qi gong” style that turns away blades before they can cut the skin. There are several main characters, including the titular aunt (Hui Ying-Hung), her older nephew (played by director Lau Kar Lung), and the newphew’s son Charlie Yu, who is just a smidge younger than his grand-aunt. Of these, the most fun to watch is Charlie, played with limitless energy by Hou Hsiao. In person, Charlie would probably be unbearable because he just can’t sit still. But Hou Hsiao controls the energy, and on screen, it’s a joy to watch. Commentators Klein and Mitchell compare him to Donald O’Connor in Singin’ in the Rain, but I was put in mind of West Side Story. If you’ve seen it, you know that the Jets and the Sharks never simply walk, they jazz-run. That’s how Charlie and his four sidekicks move in My Young Auntie; never simply walking when they can glide, sashay, strut, or jump. My Young Auntie isn’t great cinema. But to my surprise, I didn’t find it unbearably cheezy, either. The joy of movement, the good-natured goofiness, and the talent displayed by those involved make My Young Auntie a respectable piece of entertainment. The audio commentary is provided by Andy Klein and Elvis Mitchell, two guys I’d love to see a movie with. Both men have done their research on My Young Auntie, and they’re good off the cuff, too. Klein, with his Dave Frischberg-hip nasal voice is a constant on these Dragon Dynasty DVDs, so I assume he’s the more knowledgeable of the two when it comes to Shaw Brothers cinema. But Mitchell, who wrote for the New York Times, is no slouch. Their comments tend toward film history. They make connections to other films, both in and out of the genre. They know more than I do about Shaw Brothers movies, if you’re a die-hard kung fu fan, you may know more than these guys, and may not be interested in their broader perspective. For most of us, though, it’s hard not to like hearing these guys talk. There are interviews on the DVD with Kara Hui (AKA Hui Ying-Hung, the lead actress) and Andy Klein with David Chute. I didn’t find any of them particularly insightful, but maybe you will. There are also trailers for other Dragon Dynasty DVDs, a stills gallery, and biographies for the commentators. Picture quality is, once again, almost unbelievably good. You can see trailers for this film on the other DVDs in the Dragon Dynasty series, and many of those trailers show scratched, badly faded scenes from My Young Auntie. But the feature film is gorgeous, with no flaws and no fading. The audio track is encoded in 2.0 stereo, which is quite acceptable, given the source. The English dub track isn’t nearly as good as it was on The One-Armed Swordsman. The language doesn’t flow as well, and the English-speaking voices sound too cartoony for my tastes. Better to watch the subtitled version or the audio commentary. None of the extra features on this DVD are as essential as the extra features on the other DVDs from this series. That being the case, pop in the movie. Set the audio track to either the original Chinese or the audio commentary (not the English dub), and push play. Skip the extras unless you’ve got too much time to kill.